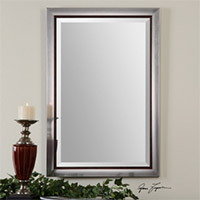 Whether you want Venetian or Pivot mirrors, at DistrictDecor.com every aspect of bathroom mirrors is addressed. Regarded as a necessity in contemporary bathroom settings, an artistically influenced mirror can be the defining feature of the bathroom. At this online platform, you get the entire range of bathroom mirrors, including lighted and extension mirrors apart from the not-so-common Captain’s Mirrors to the vastly popular Vanity Mirrors. We have taken the time to help you outgrow traditional concepts of Medicine Cabinet Mirrors, ensuring the sink ensemble appears more fashionable. From elegant to chic mirrors, from rustic to those with a sharp sense of modern designing, you will find the one that matches your style & needs. Please browse through our selection of framed and frameless mirrors for popular bathroom themes like romantic or seashore bathrooms. The most popular members of this growing fraternity include the Adara Vanity Mirror and the Hichcock in distressed finish. Bathroom Mirrors There are 43 products.